Cruise Ship Waiter, Waitress Jobs. 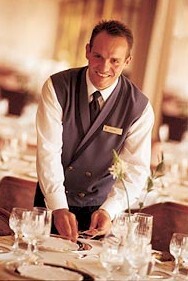 Waiter, waitress jobs on cruise ships. Vacancies, job description, requirements and salary range. - Responsible for all food and service related issues within his/ her work station and serves passengers according to the highest standards set by the cruise line. - The Waiter / Waitress must know passengers by name, escorts them to their tables, presents the food and beverage menus, suggest particular courses and wines and would kindly answer to any questions they may have regarding menu items and wine list. - Must learn the USPH / UKPH regulations and to make sure that all work is carried out according to these standards. - Attends various training session orgainized by direct supervisors and the head of the department, further improving his / her performance level and preparing for a career advancement to a higher position within the cruise line. - Responsible for setting the tables, obtaining and arranging linen, silverware, china and glassware. - Must relay all passengers orders to the galley, then would serve the various courses and beverages making sure that all items look presentable and are properly garnished and decorated before serving. - Helps to set up special events and functions as instructed by the ships management. - In addition to the routine restaurant duties, he / she may be required to perform some other functions, such as greeting passengers upon embarkation, serving at afternoon teas and Captain's Welcome cocktail parties. - Must actively participate in dining room entertainment according to established practices of the cruise line and alterations based on the specific itinerary - Caribbean nights, Italian nights etc. Minimum two years of waiter/ waitress experience in a restaurant, hotel or resort. Cruise ship experience is preferred, but not mandatory. Ability to calculate figures and amounts such as discounts, interest, commissions, tips, proportions, percentages. Good interpersonal skills, positive attitude and willingness to learn. $2500-4200 U.S. per month depending on the cruise line, size of ship and gratuities from passengers. Possibilities for promotion to Dining Room Head Waiter / Waitress position.